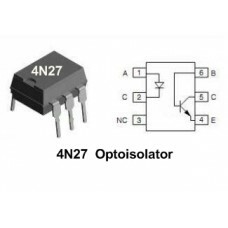 4N27 Optoisolator ICs, 6pin DIP. 5 Pieces Pack. Manufactured By M..
4N33 Optoisolator/Optocoupler ICs, 6pin DIP. Pack contain 5 ICs. Manufactured..
555 TIMER ICs , 8-PIN DIP Casing. Pack contain 10 units/ICs. A must have in an..
555 TIMER ICs , 8-PIN DIP Casing. Pack contain 100 units/ICs. A must have in a..
555 TIMER ICs , 8-PIN DIP Casing. Pack contain 25 units/ICs. A must have in an..
555 TIMER ICs , 8-PIN DIP Casing. Pack contain 50 units/ICs. A must have in an..
5 IC's pack - 74161 74161 (SN74161N) Integrated Circuit, DIP-16 Case. ..
5 IC's pack - 74165 74165 (SN74165N) Integrated Circuit, DIP-16 Case.&nbs..
5 IC's pack - 74197 74197 (SN74197N, DM74197PC) Integrated Circuit, DIP-..
5 IC's Pack - 74HC366 High Speed CMOS Logic Hex Buffer/Line Driver. 16-DIP ca..
74HC368 (74HC368N) Hex buffer/line driver, 3-state, inverting ICs. Pack contain 5 I..
3 IC's Pack- 74HC4020 (MC74HC4020) 14-stage binary ripple counter ICs. 16pins-DIP ca..
5 ICs pack- 74HCT03N 74HCT03N Integrated Circuit, DIP14 Case. Quad 2-input NAND gat..
74HCT137 3-to-8 line decoder/demultiplexer ICs. (Pack of 5 ICs) 16-DIP case. ..